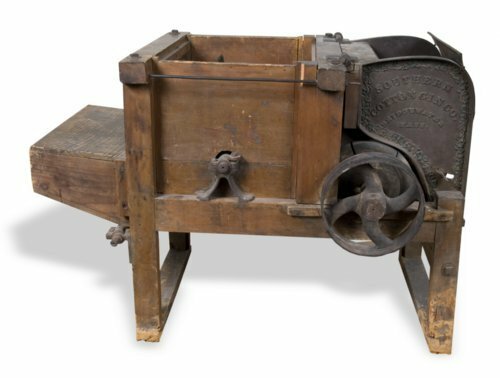 The Southern Cotton Gin Company of Bridgewater, Massachusetts, manufactured this wood and cast metal cotton gin. Joseph Piazzek, a Polish immigrant living in Valley Falls, Kansas, purchased it for $60. Although not a significant crop in Kansas, cotton was grown more frequently during the Civil War when southern cotton was scarce. Piazzek processed bolls from as far away as Fort Scott in southeastern Kansas, typically accepting one-fifth of the finished product as his fee.